Hersheypark Stadium, Hersheypark Arena, Giant Center, Chocolate World, and the Hersheypark itself all fill a giant swath of land just north of town on aptly named Hersheypark Drive. The stadium and surrounding venues sits below the hillside of the Milton Hershey School. For those who may not know, the Milton Hershey School is a private boarding schools (which sponsors football) that was founded by Milton and Catherine Hershey. After his wife’s death, he gave controlling interest in the Hershey’s company to the school. So, just remember that when you buy Hershey’s candy that you’re funding the school. The school itself has $7.8 billion in assets. Which would make it the tenth largest endowment for a university, if it were one. And that’s inluding system-wide endowments Texas A&M. Oddly, though, for all the money and the number of students, they’re not a force at football. However, their school dominates the landscape above the north endzone of the stadium with “WELCOME to HERSHEY” written in the landscaping below. I’ve had issues with this stadium before, and I still generally do not like it for a variety of reasons. Chief among those, is that the stadium was never built specifically for any one sport. It’s all-purpose nature led it to be constructed oddly. First, it seats a generous 14,000+ on plastic benches on concrete stands. The field, though, is not centered for the stadium. Mirroring each side, the southern most sections are beyond the entire south endzone. Also, the stadium is set extremely wide, as there is a good 20 yards of space on each sideline. The stadium sports unadorned field turf with lines for four different sports (Football, Soccer, Lacrosse, and Field Hockey). The food vendors are small ‘carnival’ trailers under the stands, and a few permament structures built separate from the stadium. The stadium, though, has an impressive columned facade. Now, for positives, the parking is more than ample. It’s also free. The complex shares all parking, and there is more than could ever be used for the stadium. Chocolate World sits to the southwest corner of the stadium and is a draw in and of itself. Definitely a good time-waster between games. Giant Center, which is also aptly named, sits on the west end of the complex surrounded by parking. 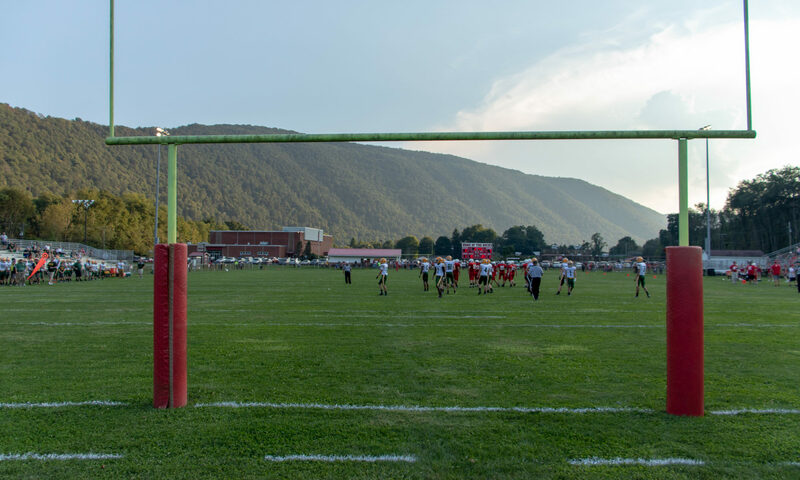 Pennsylvania, for as large as it is, has only four classifications for football. Privates are mixed in based strictly on enrollment. Though, Pennsylvania does have two oddities. First, is the ability to ‘play-up’. Any school can elect to play up to a higher classification for a two-year cycle. Aliquippa is a notable example, as they have played up to 2A insead of sitting at 1A. Also, co-ops only required half of the other school to be counted toward the enrollment. So, a school with 100 male 9-11 students co-ops with a second school of 100 male 9-11 students and their enrollment number would be 150 instead of 200. This encourages small schools that don’t support football to get into a co-op with other schools. Pennsylvania also has an odd structure to their playoffs. First, there are two levels, District and State. The state is divided into 12 generally geographical districts. They’re not equal in size or geography. They’re also autonomous. The only thing the state requires is that their champions (by enrollment) get crowned by a certain week to enter the state playoffs. So, each district has their own rules and protocol for the playoffs. Some have mandatory scheduling, some don’t. Some use leagues, while other use regions. Some have a lot of teams, some have only a few. Now, onto the championships. The four games are split over two days during Week 16. 1A and 3A are held on Friday, while 2A and 4A are held on Saturday. The Friday games start at 1pm, while the Saturday games start at noon. The second game starts 6 hours after the start of the first. This gives plenty of time to take a break between games. Either for Chocolate World, or to go eat elsewhere. Tickets are $8 each at the gate and though you can’t reenter the current game, you can use your ticket stub to enter the late game. As noted, parking was free. And the program was the usual $5. So, for two people to attend all four games cost a total of $37, or $4.625/game per person. This was a good game, ending with a brawl by Clairton. Upset with a two-point conversion that failed. A late drive that a team with a kicker could’ve depended on a chip-shot kick required a fourth-down pass into the endzone that was incomplete. Generally a good game, but marred by the craziness that ensued. This game wasn’t much of a game. Archbishop Wood was just a powerhouse, appearing in their fourth straight championship game appearance and their third overall championship. Their two previous championships came over Harrisburg Bishop McDevitt, and their lone loss belonged to Erie Cathedral Prep. Central Valley was the first public school since 2009 to reach the championship game. This was the first repeat 2A champion in PIAA history (1988 was the first year of state playoffs). Dunmore was making their third appearance, and against fell. This was an amazing game. #7 D’Andre Swift for St. Joseph’s Prep was well named by his parents. Pine-Richland trailed 42-21 in the fourth quarter, before rallying for three touchdowns. One thanks to a botched kickoff coverage by St. Joseph’s Prep. Down 42-41, though, Pine-Richland chose to go for the win with little time left. After failing, the onside kick also failed. Though, in a twist, St. Joseph’s Prep scored quickly to make it 49-41. Pine-Richland went downfield quickly and was at the St. Joseph’s Prep 25 yard line with 2.9 seconds left. The potential touchdown pass never found its target and was easily picked off. The crowds for the games were anemic. The total posted online for all four games was a mere 11,000. How that number was determined, it was fairly accurate. The games are shown state-wide on Pennsylvania Cable Network, which most of the state receives on cable. So, it’s quite possible the crowds are hindered by the similar complaints of Ohio. Travel. Though costs are extremely cheap. $8 for a championship game with free parking is quite a deal. If you want to see multiple games, it’s even better. The biggest obstacle is the time of year. The second weekend in December is a tough sell for those planning their holidays. Especially the Friday games. A major decision may be coming as to the number of classifications. A move to six has been discussed for years. However, the WPIAL (District 7) is vehemently opposed and has threatened to leave the PIAA if the state goes to six championships. 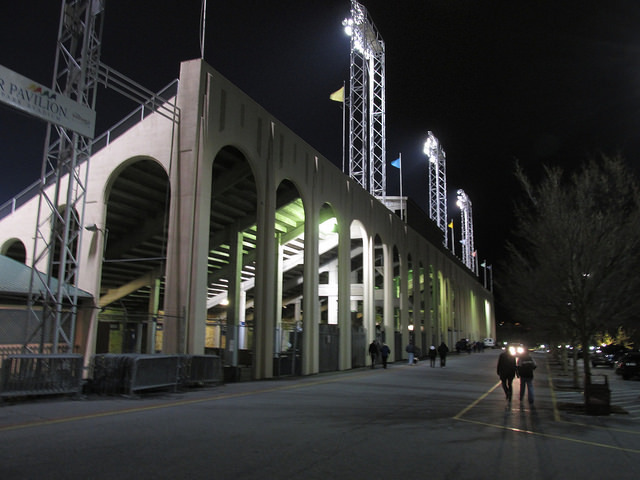 The primary reason is that the WPIAL holds all four of their championships in one day at Heinz Field. Heinz Field will not allow more than four games to be played, and only allows games to be played on one day. This would force the WPIAL to host at least two games elsewhere, which they are are against. Mostly because four of the twelve teams in the championships would have to play somewhere other than Heinz Field, and would be against being one of games not playing at Heinz Field. In addition to the classifications, is the similar argument in Ohio over private schools. This year 3 of the 4 championships were again won by private schools. Both multipliers and seperation have been discussed. Unlike Ohio, there is no open-enrollment in public schools. And recruiting or changing schools for athletic intent are banned. However, proving it is another issue. This problem is much more prevalent in basketball. In all, I enjoyed the games. Other options would’ve included heading down south for games. If not for the Browns-Bengals game that turned into a snuff film, I would’ve probably attended games elsewhere. Such as in New Orleans. For Week 17, it’s on to Texas and Week 18 is in Florida where I am right now.